Who's a bundle of cute fierceness? That last one was an impression of me trying to wake up this morning. Holy Moly! That is the cutest thing I have seen this week! I want one! A big ol blog birthday shout out to blog co-founder and lead code monkey, Bobber. I'm taking an awful risk today..I am wearing all cotton clothing and a pair of sneakers. Hope I don't die exposure. Oh my goodness we have achieved cuteness overload! Good Morning! Once the rain clears out, we are taking Duke to Great FAlls NAtional park! Can someone PLEASE tell me why Netenyahu and others are against this Iran deal? Because they lose control and influence over the region, and over us as allies. Their time to do whatever they want without meaningful political blowback is coming to an end. As for the others (the lolGOP), it's the same reason they want to repeal the ACA and replace it with an identical law under a different name. They want to take the political credit that Obama and the Dems got for doing it. I'll put the air wing on fire alert for later. Raine, is the expected conflagration on the confection sufficient enough to require aerial action? 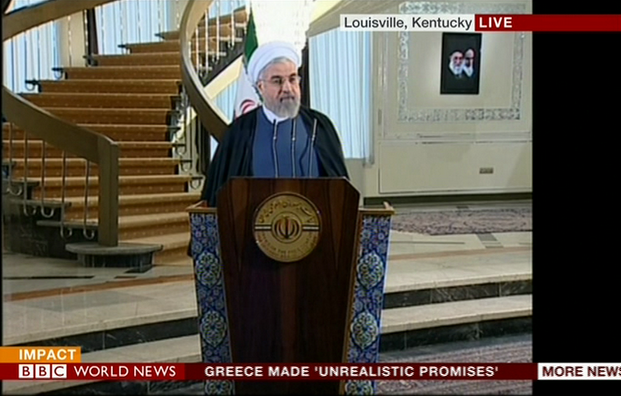 Relations with Iran have really REALLY REALLY progressed since yesterdays announcement! Because Isreal wants to maintain its monopoly on nuclear weapons in the region. Why do you think they have peace treaties with Eygpt, Jordan & Syria (I think)? Tossing vaseline? That's a new one on me! And for those like Tehran Tom, his masters in the "defense" industry won't be able to make billions selling bombs to blow up more brown people. "Working near the gun range in Durham (CT). I guess a lot of gun owning mofos have the day off. Sounds like a war zone over here!" "It's what Jesus would've wanted." Happy Birthday, Bob!!! Enjoy your special day!!! May this year of your life be filled with the blessings of health, happiness, hope, peace and success!!!! Hey Mondo - you know something about Outlook, right ( I mean other then you hate it). Do you know a way to get around someone declining a return receipt for an email? If they literally refused to send a read receipt, then you need to do a delivery receipt instead. That's about the only recourse I've discovered. I need baseball so bad I don't even care that the Yanks get first pitch today. PLAY BALL! No treaty with Syria, like the neo-cons they are on the "get rid of Assad" bandwagon even if under the current situation it would be put Islamic State in power. Thom Hartmann also suspects that there may be some nervousness within the GOP about a warming of relations could lead to a leaking out of documents about an alleged 1980 deal between Casey, Poppy Bush, and the Iranians. Duke swam in the Potomac today!